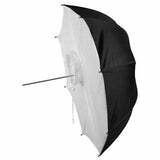 Start controlling and modifying your light with this White/Black Umbrella. 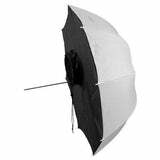 In general, the umbrella will soften and broaden the light output of any strobe or lower wattage constant light. 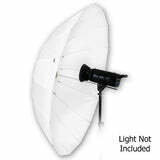 This model features a reflective white interior to provide a moderate contrast and a neutral color rendition that reflect more natural-looking catchlights in the eyes of your subject. 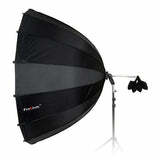 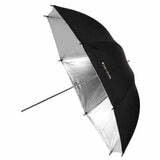 The umbrella also has a black backing to minimize light loss and light spill while maximizing output. 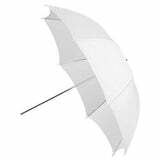 Umbrellas with a white interior will soften and weaken light more than an umbrella with a silver lining. Most studio lights include a built-in umbrella receptacle for instant mounting. 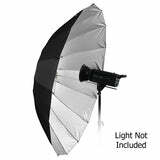 There are also a variety of mounting brackets available for speedlights with adjustable and tiltable options for precise positioning.